I read this recipe in an issue of "Cooks Illustrated" magazine. The original recipe called for gruyere cheese, but I had gouda in the ice box...and it worked just fine. 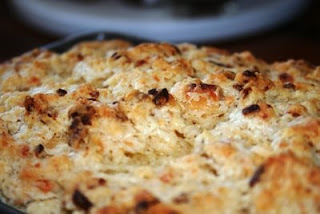 The recipe is amazingly simple and the results were spectacular. All I did was take a chunk of gouda (about 8 ounces), grated half of it and cut the other half into small chunks. I mixed the cheese with 3 cups of AP flour, 2 tablespoons of sugar, about a teaspoon of salt, a teaspoon of black pepper, 2 teaspoons of baking powder. Then I dumped a 12 ounce beer in it. I used Harvest Wheat, but even cheap beer would work. The beer needs to be lighter, because the fuller flavored beers might make the bread bitter. 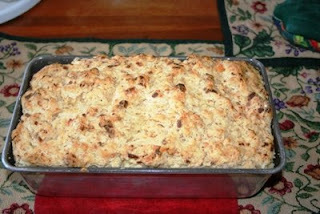 After mixing everything together, I dumped it in a loaf pan and poured 1/2 a stick of melted butter over the top. It baked in a 375 degree oven for about 50 minutes. After about 5 minutes out of the oven I took it out of the pan and let it cool on a rack. I only made it about 10 minutes before I had to slice it, because the aroma in the kitchen was insane. Here's a close up of the craggly top. If you like cheese and beer, YOU NEED TO MAKE THIS. RIGHT NOW.